Taking on the challenges presented by a water heater loss, pipe burst, toilet overflow, or any other form of water damage is highly technical work and best left to the experts and this is why 911 Restoration Milwaukee owner Doyle Keith, along with his water damage Saint Francis crew are the best in the business for the job. Water damage moves quickly, but Doyle and his team move even faster, and this is why they make sure to arrive within 45 minutes of the initial call for help. Solving the vast array of water damage Saint Francis challenges that can arise from any situation requires professionalism to the nth degree. This is why Doyle and members of his water damage Saint Francis crew are licensed, insured, bonded and IICRC certified for all types of restoration situations. Don’t let the quick moving and rapidly damaging effects of a water heater loss adversely affect your lovely home or business. Contact Doyle and the water damage Saint Francis specialists with 911 Restoration Milwaukee and get everything taken care of properly today! Doyle and the water damage Saint Francis experts know all there is to in this industry about how to alleviate the effects of a water damage scenario after they have occurred, but they are also highly proficient at helping home and business owners to avoid such situations altogether too. Never forget to keep the temperature in your home well above the freezing point so as to avoid a pipe burst scenario. A pipe burst can cause huge amounts of water damage in a short time period, and a little bit extra on the heating bill can save a lot in avoiding a burst. Take a moment now and again to ensure that the trees on your property are all well-trimmed and that there aren’t any branches that are leaning or overhanging your roof that might snap off in high wind, heavy snow or lots of ice accumulation. Have a plumbing professional come and inspect your system for anything that might become more of a problem if left to linger and stagnate. 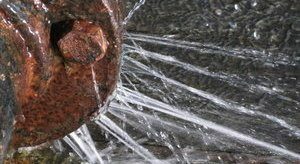 This can include small obstructions that grow over time, or corroded piping that can fail under pressure. Inspect the hoses and fittings on your appliances to spot any small nicks or cuts that may become full ruptures under pressure. A ruptured hose can spew huge amounts of liquid into your home causing mass water damage when you least expect it. Don’t allow a ruptured hose to flood your laundry room. Contact Doyle and the water damage Saint Francis team with 911 Restoration Milwaukee and get everything solved by the best today! Doyle and his water damage Saint Francis team have been providing solutions to the challenges presented by water invasions of all kinds, and this is how they knew exactly what to do when called out for a ceiling leak from a skylight. When Doyle and his water damage Saint Francis team got onto the roof and started opening it up to view the situation, Doyle suspicions were proved correct. Don’t allow a ceiling leak to create mass water damage and mold growth in your home unexpectedly. Contact Doyle and the water damage Saint Francis team with 911 Restoration Milwaukee and have all of your restoration needs addressed today!